Welcome to the Battle of The Reels. Penn battle 2 2500 vs 3000. Which one is better? A lot of you anglers have been asking this question. Well, let’s find out. In this article, I’m going to be comparing these two reels side by side. How’s your fishing going? Must be very exciting! However, your passion for fishing can die out soon if you face problems with your fishing equipment, or if your wheel doesn’t work smoothly. The main problem regarding equipment is to set your wheel with the right parts that match your demand and situation. And, choosing the right parts can be a very difficult job when you have tons of similar products on the market. Sad but true, most of the fishing lovers end up buying mismatched equipment! I know it’s really a tough job to choose from hundreds of products if you don’t have a friend to get some suggestions from or if you can’t find some product reviews on the net. If you are a Penn Battle user, or if you’re looking for a comparison review of the models Penn Battle II 2500 and Penn Battle II 3000, you’re just at the right place! Penn Battle is a very popular name among the anglers – mainly because of their quality products and reasonable cost. The models – Penn Battle II 2500 and Penn Battle II 3000, are designed for saltwater fishing. They say these models have been engineered to fish year after year. If you’re dying to conquer big saltwater fishes, one of these two models could just be the perfect solution for you! In this article, you’ll find a meticulous comparison of features between the two models. What do you need to conquer big saltwater fishes? Power, casting range and durability, right? You’ll find all these three in Penn Battle II Spinning Reel. The full metal construction with heavy-duty aluminum bail wire makes this reel perfect for you to land your catch. You’ll be able to enjoy a powerful yet smooth drag with this reel, thanks to HT-100 Versa-Drag carbon fiber drag system. Besides, pullback while reeling is eliminated due to the instant anti-reverse bearing. On top of that, smooth operation and sustainable performance of this reel will definitely make you fall in love with it. The five stainless steel ball bearings are sealed in this reel to prevent water intrusion. This feature will ensure you extra durability in salt water. The advantages of this reel won’t just end here. You can even use braided line without the backing of monofilament. This is because the reel is fitted with a rubber gasket preventing the Superline from slipping under pressure. The spool is also suitable for use with Berkley or Spiderwire Superline. Ambidextrous is yet another amazing feature of this reel. The crank handle can be installed on either side, that is, the reel is both right and left-handed. There is a cover you can unscrew to switch the handle. By just giving a glance at the specs of the two models, many beginners might feel that both the models have almost similar features. However, pro-anglers would find the small differences very handy as per their demand and situation. 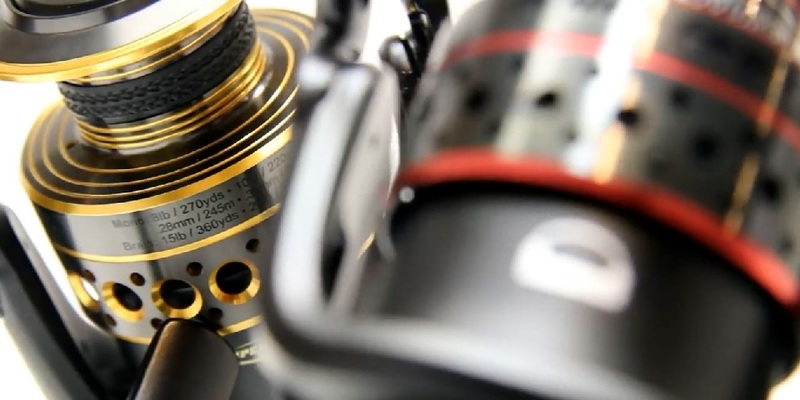 The mono capacity range for Penn Battle II Spinning Reel, 2500 model ranges from 255/6; 175/8; 140/10 (yd/lb) while that of Penn Battle II Spinning Reel, 3000 ranges from 200/8; 165/10; 120/12 (yd/lb). On the other hand, the braid capacity for Penn Battle II Spinning Reel, 2500 model ranges from 240/10; 220/15; 160/20 (yd/lb) and you’ll find the braid capacity of Penn Battle II Spinning Reel, 2500 model to be 250/15; 180/20; 130/30 (yd/lb). Both of the models have a bearing count of 6. If you’re looking for bigger fish, Penn Battle II Spinning Reel, 3000 would be the best option for you as it has maximum drag power of 15 lbs while Penn Battle II Spinning Reel, 2500 has 12 lbs of drag power. If you count the gear ratio, both the models have same gear ratio, which is 6:2:1. Penn Battle II is definitely a step compared to the Fierce II. Trust me when I say this, Penn makes some really good products. The Penn Battle II 2500 actually filled the gap between 2000 and 3000. The reel is in the 2000 size body but with a bigger rotor and bigger spool. The 2500 is a perfect reel for lightweight graphite rods. It really balances the weight distribution on a 7-foot graphite rod. On the other hand, The Penn Battle II 3000 adds a little more weight to the fishing rod. If you want to do some inshore fishing, the 3000 combined with an Ugly Stik Rod should be a perfect match. Again, both of these reels are great. Just depends on a fisherman’s requirement. Hope you liked the Penn battle 2 2500 vs 3000 comparison guide. Let me know which one you picked in the comments below.